Great location on walking distance to the city center. The family running the hotel is very nice and made us feel at home! I really recommend Polydoros if you are planning to stay in Agios Nikolaus. It has a beutiful private beach, amazing view and is quite. Room was clean, modern, separate kitchen/dining section and bedroom. Beautiful views of the town, beach and mountains and only a short walk to town. Staff were helpful, friendly and welcoming. Room was serviced well, each day. the welcome and level of care and love i felt was amazing. it was a home from home feeling. Friendly and attentive owner and staff. Excellent location. Met all of our needs for a quiet relaxing holiday, not too far from the centre of Agios Nikolaos. Exceptional friendly family run hotel. 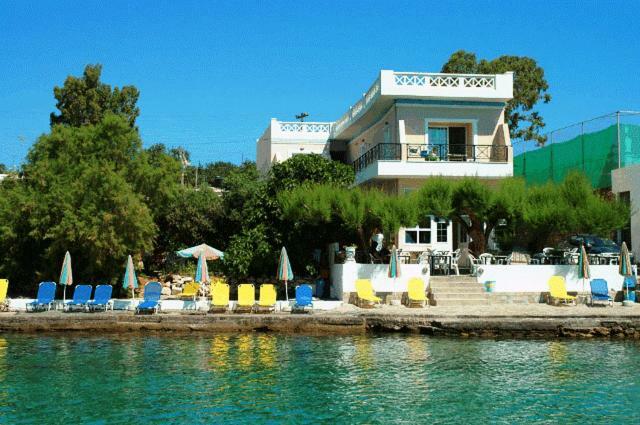 Perfect location with views across the bay of Agios Nikolaos. Wonderful place to stay (in early October). My room was a 10 second (yes second!) walk from the sea (not a beach, but a stone plateau that was perfect for catching the sun)! Hosts very friendly, and let me stay in room all day on the day of my departure. A fair walk from main town, but it was nice to be a bit further out. I highly recommend hiring free bike at tourist office! Enjoy! Beautiful location, just a few steps to sea! Very friendly hosts and a lovely buzzy atmosphere by the bar area but very relaxed. A nice easy walk into Aghios Nikolaos and an easy drive to Elounda. Car park on site though a little rough under foot. Would definitely stay again & recommend to friends. Lock in a great price for Polydoros – rated 9.4 by recent guests! Polydoros This rating is a reflection of how the property compares to the industry standard when it comes to price, facilities and services available. It's based on a self-evaluation by the property. Use this rating to help choose your stay! One of our best sellers in Agios Nikolaos! In Agios Nikolaos, just 20 feet from the beach, offering close proximity to local amenities, Polydoros features traditionally furnished studios and apartments with free Wi-Fi. The simply furnished studios and apartments at Polydoros are air-conditioned. Guests have access to free on-site parking. Some have balcony with sea views. Guests can head down to the sandy beach for a morning of swimming and lounging in the sun. Later in the day, the hotel snack bar (open during the summer season) serves refreshing drinks. Bars and restaurants and a mini-market can be found just 50 feet away. The center of Agios Nikolaos is one mile away. 뀐 Located in the top-rated area in Agios Nikolaos, this property has an excellent location score of 9.7! When would you like to stay at Polydoros? Studios enjoy direct access to the grounds. This apartment has a balcony overlooking a tennis court. Opening to a balcony with direct sea views, this seafront and air-conditioned, 1-bedroom apartment has a TV and a kitchenette with mini oven with cooking hobs. Free WiFi is provided. This air-conditioned apartment has a TV and kitchenette with fridge, electric teakettle and coffee maker. Ειναι ενα μικρο ξενοδοχειο διαμερισματων πραγματικα μπροστα στο κυμα.Ειναι φιλικο,οικογενειακο με ενα snack bar στην εισοδο του.Αρκετα διασημο το snack bar για την ομελετα του.Ο ιδιοκτητης θα κανει τα παντα να ευχαριστισει τους πελατες του οπως και η μητερα του.Νομιζω οτι θα ειναι απο τις καλυτερες διακοπες σας αν το επιλεξετε. ο ιδιοκτητης μουσικος και τραγουδιστης η μητερα του ζωγραφος..Οπως αντιλαμβανεστε ειναι και καλλιτεχνικο στεκι το snack bar του ξενοδοχειου. House Rules Polydoros takes special requests – add in the next step! One child from 2 to 12 years is charged 20 % of the room stay per night when using existing beds. Polydoros accepts these cards and reserves the right to temporarily hold an amount prior to arrival. Location is extremely good. Breakfast excellent. The only thing you could really fault is a design one: that is that there is no window in the dining area section of the room I had - but I ate either with the door open, or on the balcony, or out, so it really isn't a problem. Thurs, Friday & Saturday disco next door played loud thumping music from 10:00pm til 4:00am. Rest of evenings apart from Sunday the music finished around midnight. If you like dancing then it's great, if you need to sleep and are a light sleeper, forget it until after 4:00am - such a shame as the apartment is perfect. The balcony was great, views over Azure blue sea with promenade close by enabling you to walk into town/restaurants within 20 minutes with wonderful sea views. Owner Panos very friendly and helpful. Small thing, but there was an emergency exit light in the room that stayed on all night. Had to cover it up with a black T shirt. Sleep maniac!